Sorry for taking so long to update this blog. Have been extremely busy with my midterms (Thank God, all over!) and alot of other work. In my university, there is this project called the 'Trent Pen-Pals'. If you're thinking it is a project where we write to our peers around the world to share experiences, well, it's not that. This project sees university students from various disciplines (but mostly education-students, I heard) are paired with elementary students from schools around the area. So, we basically write to children! 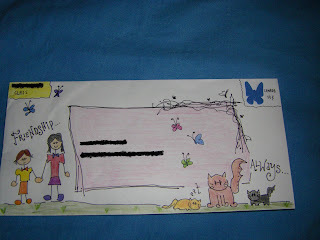 My pen-pal is a 7 year old girl called Natalie (all other information is private lar, k?). She wrote me the cutest letter with coloured leaves, but for privacy reasons, I'm afraid I cannot show you a picture of it as it has information about her and family. I tried to keep my reply to her as simple as possible (we have a lot of 'rules' we have to follow, like number of sentences, and yet we need to answer all the questions they ask). It's just so relaxing to write simple, plain English. I had a really nice time using my colour pencils too! My friend Eva, who helped me draw since I can't draw to save my life, was laughing the entire night as I coloured my time away. Your awesome. Really admire you. You have been brought up well! Kudos to your parents. Keep it up girl. Hey, this is interesting! Maybe we should have this also in Malaysia, don't you think? That's a really cool looking letter.. I am sure Natalie will be thrilled to bits!! Your letter to Natalie's so cute. I as an 'orang tua' pun will be excited receiving letters like that... Cantik! Oh that's so so so so cool. Maybe I could write to.. err... someone. I'll figure it out first. That's so cool! my son too has a 'buddy' at school. A big sister (sort of). Quite a good concept..it helps him navigate his way through his school life. She helps him with reading and drawing. It's fun, yea?!! Keep it up! I'm sure natalie will be thrilled to get your card, esp when it is hand made. btw, u are not alone. I fail miserably when it comes to arts, the opposite of my daughter. Especially because its been so cold!!!! Its madness.. I don't remember last year being this cold.. I hope you're not frozen yet nai..
Wei Chieh bought me a hot water bottle too! Supposed to be for winter but he so me freezing and he let me open it early :) hehe.. I love those letter you used to spell out her name with th giraffe shape. Can I know what is it? U make it your self or you bought it? Will reply to your comments in a while lar, k? Thanks! VERY destressing, I tell ya! Hey, everybody's jumping on the bandwagon! That's cool! You can write to anybody ler...Write a letter to your mum or sister or friend? Ah...You're in Australia, right? Their version of the 'Kakak angkat' system? It's cool, I think. To have someone older to help you with stuff that you're struggling with, like an older friend? I like it! I mean, 1400 volunteers? Wow! Hi Daphne, looks like you've settled well in Canada. That's a great program for Social studies. My daughter have similar program, they write to pen-pal from another elementary school. And then the schools organize a "met-yr-pen-pal) trip, this year my daughter got to go to the other school to meet her pen pal.